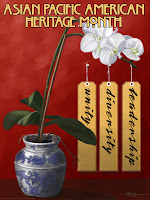 Asian Pacific American Heritage Month and HUGE Giveaway! I am going to focusing on something special this month. As we all know February is Black History Month. But did you know that May is Asian Pacific American Heritage Month? What's that? You didn't know? Well now you do. And you're going to learn more about it because I'm going to focus about this subject throughout the month of May. Why? Because many people don't know that May is set aside for APAH, we certainly NEVER learned about it in school. I'm hoping to make this a yearly event, but we'll see how this one turns out. I'll be posting reviews of books by Asian American authors or featuring Asian American characters, reviews of movies directed or starring Asian Americans, have posts by guest bloggers, historical posts, spotlights of famous Asian Americans in politics, business, sports, entertainment, literature, etc. and posts sharing my own personal thoughts about what it's been like for me as an Asian American. So every time you see this logo, you'll know it's an AA post. And to start things off I'm having a Asian Heritage Month Giveaway courtesy of Hachette Publishers! This contest will run throughout the entire month of May. To enter you must leave a comment with your email address so I can contact you if you win. I'll pick a name and announce the winners on Monday, June 1. US and Canada addresses only (No PO Boxes). Good luck! PLEASE LEAVE A WAY FOR ME TO CONTACT YOU!!!! ENTRIES WITHOUT CONTACT INFO WILL NOT BE ENTERED. Great giveaway! I'd love to read these books! Oh, very cool theme for the month of May! I'm looking forward to learning more about APAH!! I did not know it was Asian American history month! I am so glad you are doing this. I will read it every day. Well, I do already, LOL! I just read a book called "North of Beautiful" (I reviewed it on my blog last week) half the book takes place in China. I absolutely loved this book! But I have to say, sadly that it was the first book I have read about an Asian country. I would like to read more. Also, please enter me in you giveaway. Ooh, great giveaway. I'll follow this month's posts closely (I have a HUGE fascination with Asia). I'd love to win these books! Please enter me! milou2ster(at)gmail.com Thanks for the great giveaway. Since my mother moved to Hawaii, I've been picking up more books in this genre. Thanks for the giveaway offer! Wow, five books by Asian American authors. Please enter my name. Thank you!! I would love to read all these books! I really need to up my library's AA quotient. Help me out! Thanks for the contest. It's fabulous. Please enter me. I have read the Fortune Cookie Chronicles but not the others. My PBS ID is esjro. Thanks! Deborah, this is so exciting! I'm so glad that you're doing this. You're absolutely right, it's something that we never hear about. It's great that you're raising awareness for APAHM. Please enter me. Thanks for the giveaway! What a terrific giveaway - and a terrific tradition. :) Please count me in. Happy APAH month! I can't wait to read all the special posts! Great book collection. Thanks for the chance to win. What a great contest!! These books look great!! I would love any of these books. Great giveaway! Please enter me: janemarieprice [at] gmail [dot] com. I just finished SAfely Home by Randy Alcorn last night, I highly reccommend it! Great giveaway to bring focus to APAH! I would love to be entered. I just finished an ARC copy of Shanghai Girls and I'm really into reading about the Asian culture. Yay! Pride month for us at last. This sounds really great! I'm always interested in connecting with my heritage and reading more books by Asian American authors (which I don't do enough of), so I'd love to enter. I'm succedanea AT gmail.com . Thanks! These books all look good. Thank you for the giveaway! Thanks! I'd love to win these books. Thanks, and enter me please! I had no idea it was Asian History Month! I think that's great! I love to read about anything Asian, so please enter me for this!! Hi! These books sound amazing! I'd love a chance to read them! this sounds great! I heard Ronald Takaki speak almost 20 years ago. pls enter me in the contest. I would love to win! I look forward to reading more asian literature. Thank you! I would love to be entered. I was sent by the wonderful Aliadam. This looks like a lovely collection of books - pleaae count me in. Thank you! I would love to enter the contest. Loved your research,it was great. Would love to own these! These look like some good books! Thanks for the opportunity! I would to win these great books,please enter me in the drawing. What a great theme---some great books, too! This is a wonderful selection of titles and I need to read them all! Thanks for the chance to win. Great giveaway! I'd love to be entered! Wow! This has my name all over it!!!! Hi, I surfed in from Book Blogs at Hachette. I would like to win too. Thanks. I love finding new authors to read! I really wanted to read more books by Asian-American authors. This looks too good to be true. This would be a wonderful set of books to win. Please enter my name in your draw. Thanks. I'd love to win this great set of books - please count me in! Hi! I just found your extremely interesting & versatile--not to mention *uniquely fun & Christian-themed*--blog from the Damaged Books Forum on PBS.com this morning. The only books on Asian culture I've ever read thus far are ones by Amy Tan, and I'd really like to broaden my Asian horizons with this collection of books! The Fortune Cookie Chronicles is an especially intriguing title; wonder if it has a recipe therein? LOL. This looks really awesome, please enter me! I'd love to win these books! It cracked me up, as this was a grown lady. Anyway, please add me to your contest. This is a great giveaway. Sign me up! I'd love to read this collection of books. Please count me in. Thanks. Please drop my name in the hat - thanks very much for the book giveaway. I'd love 5 new books! Great contest! Please enter me! I'd like to enter, please. These look like wonderful books! Please enter me as scrybe@rogers.com. I am eager to expand my knowledge of Asian writers and winning this contest would really help. What a great bunch of books! Please enter me...thanks! These books look good. Thank you for the giveaway! Hey Deborah! Awesome give a away--I had no idea May was Asian month!! My contact info is janeaustenfantx (at) yahoo (dot) com. Or JaneAustenFan on PBS--thanks Deborah! I am studying Eastern culture and these books would be a tremendous help for me. Thank you for the chance to win! Would love to read these! Please count me in the drawing. Thanks! Since living in Singapore for 2 years, I've loved Asian literature. This is an awesome giveaway! I could have sworn I entered, but no comment from me! I'm glad you tweeted about it or it would have been too late. I would love to win these books. Thanks for letting me post on your blog and I have loved reading entries from this month. Chinese food! Ordering out Chinese food! Impossible where I live in the country. But the books would be nice. A Trip to Japan: A Guest Blog by Amy. What Is Asian Pacific American Heritage Month?